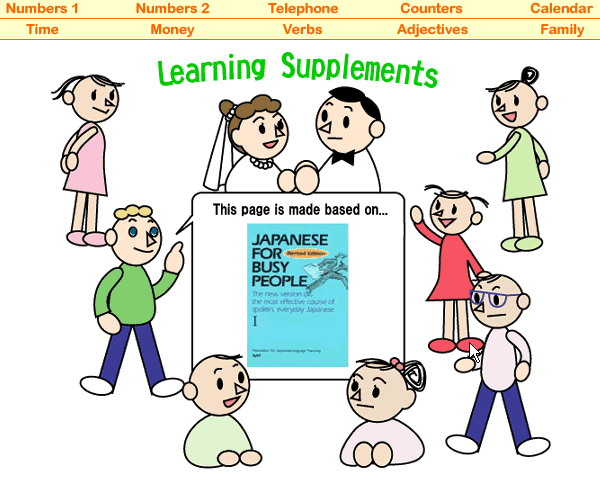 Using this site you can study elementary conversation, vocabulary, reading, grammar and so on. There is also some conversation and reading practice for advanced learners. 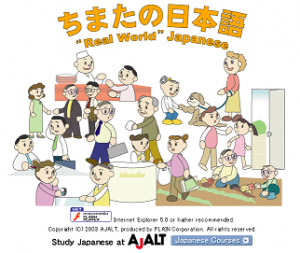 You can learn some 'Survival Japanese' and daily conversation. 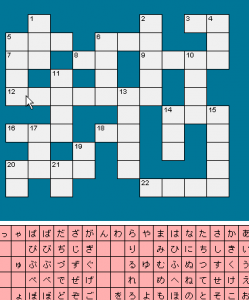 There are language games such as crossword puzzles etc. 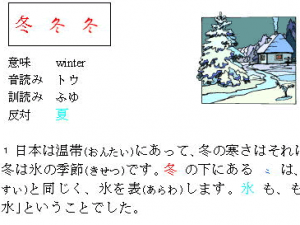 You can boost your reading ability as you read about the history and origins of kanji. 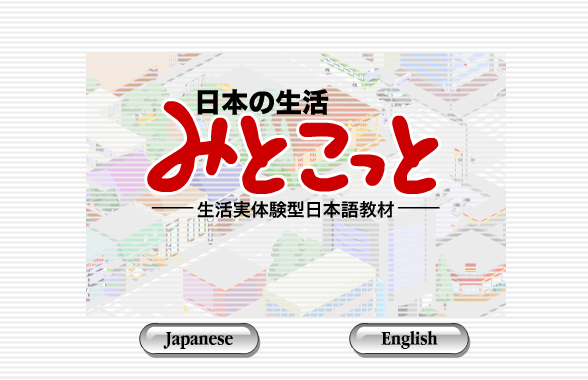 You can study some useful expressions used in scenes typical of daily life in Japan. 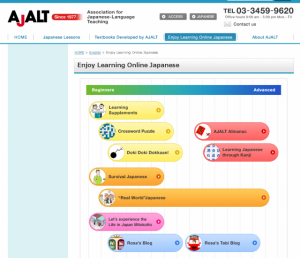 There are 8 sections of contents - listed below - designed for learners of Japanese. 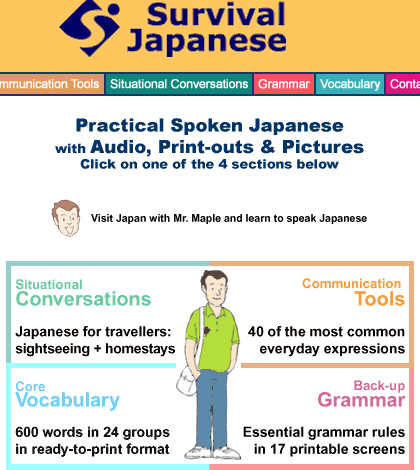 Here you'll find several simple Japanese phrases to use straight away, plus introductions to basic conversation, vocabulary and grammar. 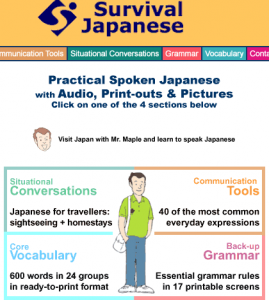 These are the kinds of things it would be necessary to get to grips with before making a trip to Japan, and you can get a head start with your learning here. These contents are also introduced in an "e! Kore" article called Survival Japanese for travellers to Japan! If you're interested, please take a look! 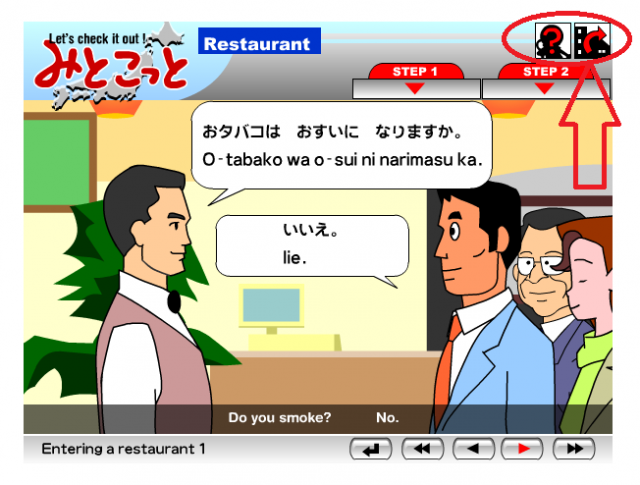 Here you can learn the kind of conversational language used in daily life in Japan. You can choose both the conversation setting and the level of difficulty. 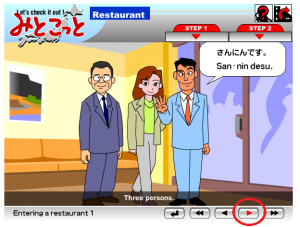 Also, you can decide whether or not to display written captions that accompany the speech, making this a very good resource for those practising Japanese conversation by themselves. 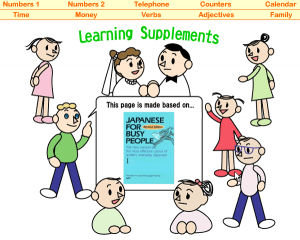 These contents are designed to complement the contents of Japanese textbook 'Japanese For Busy People'. 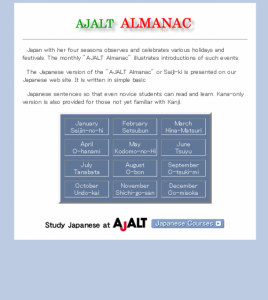 You can study how to read numbers, times and calendar dates, plus elementary level verbs and adjectives. Events and customs for every month in Japan are introduced in Kanji, Kana and English on this site. It should make good reading practice! With these contents you can deepen your knowledge of kanji and boost your reading power as you read, in Japanese, about the origins of the characters. Intended for advanced learners. 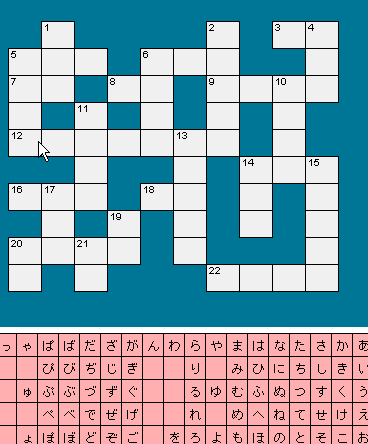 These are simply crossword puzzles that you can enjoy, whatever your Japanese ability. 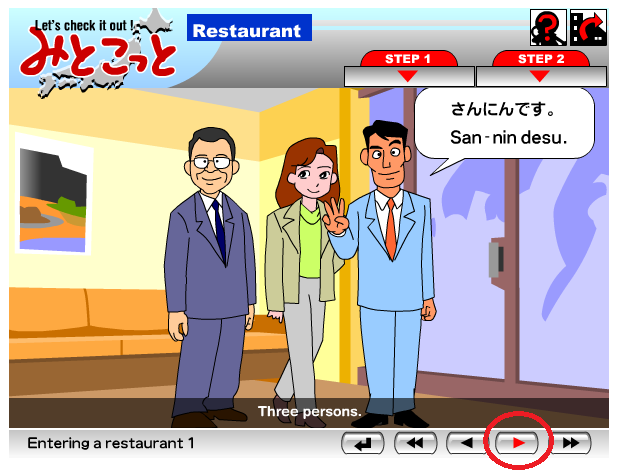 These contents are intended for beginners mainly, but they are designed in such a way that even advanced learners can enjoy them. 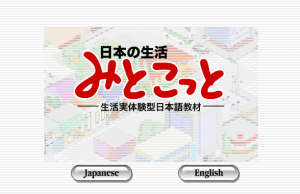 "Let's experience the Life in Japan Mitokotto"
Here you can enter various scenes common in daily life and practise the language spoken in such situations using animations. There are lots of words and phrases necessary for when living in Japan, including greetings, language used when shopping, expressions for restaurant staff and for using buses and trains. You can select the part of the town using the direction button at the bottom right of the screen. We'll take a look at 'レストラン' (Restaurant). 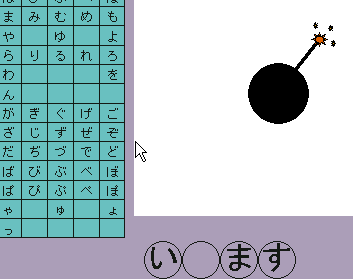 The conversation progresses through the animation. When the play button turns red, please click on it. You can see the continuation of the animation. The spoken lines are in simple Japanese. There is also romaji notation. This means even absolute beginners and learners who have trouble with Japanese script can use this for practice. 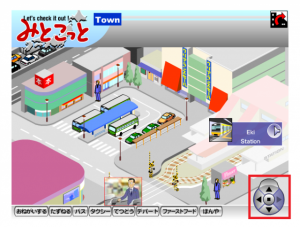 If you want to return to the town layout, click on the arrow at the top right of the screen. Click on the '?' (question mark) to go back to the homepage. 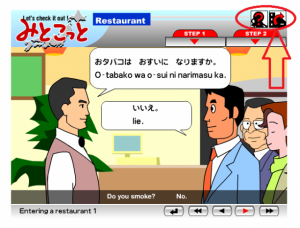 Having watched the conversation in the animation, when 'P' appears you can practise some words. Try speaking for real yourselves! One part of this site's contents, Rosa's blog, Rosa's daily life & Rosa's tabi blog is introduced in the "e! Kore" article Let's read some blogs! Please take a look, if you're interested! These contents are part of AJALT (Association for Japanese-Language Teaching).